Key Players - Melvin Gibbs - bass. Sim Cain - drums. Chris Haskett - guitars. Henry Rollins - vocals. What caused me to blow off the dust? - I heard a track from the disc on satellite radio a week or so. It had been a while since I had listened to any of the Rollins Band stuff. 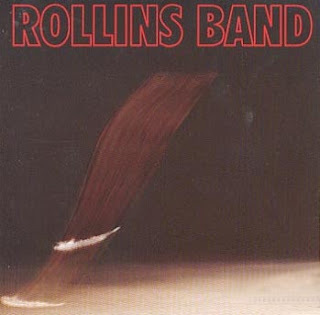 Overview - The seventh release, but fourth full length from the Rollins Band. Singer Henry Rollins formed the band, after his prior band Black Flag disbanded. This version of the band would release one record after (Come in and Burn) on a major label, and Henry would disband that version. The band would continue on under the Rollins Band name and release 2 more studio albums as well as a live album before breaking up, or going on extended hiatus...depends on who you ask. "Weight" would be the bands highest charting album as well. FDF Comments (aka the songs) - Opening with "Disconnect" guitars buzz overhead. Gibbs bass line hold steady as the first verse is delivered. At the chorus the band opens up. Henry, what he may lack in vocal abilities makes up for with enthusiasm. He wanted to grab and shake the listener. The track follows the sort of quiet loud aesthetic, but the song over all is a very strong lead off track. "Fool" fades up with a solo guitar before the band hammers down. The Rollins "band" has always been a set of strong players. Henry feeds off this. The song pushes Hank to the brink of hoarseness. The band pushes him even harder. We continue to follow the same urgency on "Icon". The bass and drums are sort of buried in the mix, but are pulled up at times. The guitar doesn't over power everything either, its an even balance, but part of you wants one instrument to stand out a little more than the other. This track has the first breakdown of any preceding tracks, we slow the pace, but its only for a few bars before an extended instrumental section brings the vocals back. Gibbs bass gets sort of tricked out with a wah/delay sound as "Civilized" comes forward. The track moves along nice, and then a sort of trademark Rollins moment occurs. Henry goes to a spoken mode of lyrical delivery. Towards the end is "sings" it, but he will incorporate spoken lyrics over the next series of albums (and did so prior). Vocals open up "Divine Object of Hatred" and the rhythm section has a strong vibe to it. The guitar and bass feed off each other with a great buzz saw sound. Overall, one of the strongest songs on the record. Up next is the familiar to some "Liar". A rather long track that is mostly spoken. I recall seeing Henry do this in a tuxedo at some awards show. It honestly stuck out like a sore thumb. I am sure he laughed on the inside. The rock returns as "Step Back" hits down hard. Both this and "Wrong Man" have a strong grinding rock feel. "Wrong Man" has a flashy guitar solo but the bass and drums really lock in and keep the track chugging right along. "Volume 4" is another track that showcases the guitar work of Haskett. Henry wants the band to really shine, and lets them go off at times, but brings it all right back. "Tired" slowly intros with bass and drums. Its a quiet, almost reserved intro. Henry whispers the opening lines and this is a trend that remains, it is a bit like "Liar" but never gets over the top. All that is thrown out the window as "Alien Blueprint" comes out of nowhere. Once again Haskett shines, but Cain and Gibbs need a nod as well. Gibbs keeps the ship steady on this track. The album wraps up with "Shine". This is a great track, and has a great Rollins Band feel to it. Where are they now? Melvin Gibbs is very busy as a composer and producer. Chris Haskett continues to perform and has worked with many artists, including David Bowie. Sim Cain continues to works as both a session and touring drummer. One of his bigger gigs in recent years was the drummer for J Geils Band in 1999. Henry continues to tour and perform spoken word concerts. Henry has said he is adamant about touring with the Rollins Band unless there is new material. The band did reform for a bit in 2006 but Henry wants to have new material to tour on as noted. On top of the lengthy spoken word tours Henry has appeared in film, written many books and hosts his own Television and Radio shows. FDF Overall Take - As noted Henry is not really well known as a great singer but he means well, and in a live setting he brings it. If you are curious about the Rollins Band this is a pretty good record to start with. Some of the later records are a little tighter musically, but this is a good launching point. As noted, Henry is a writer, and great story teller. Here are two excerpts from his book about being in Black Flag called "Get in the Van". Henry won a grammy award for the audio on this. It is a great great book, a must for any band that thinks they have what it takes to be a touring band (granted times have changed)..
What caused me to blow off the dust? - I had this on tape and had been meaning for ages to upgrade to cd, just "because". I stumbled upon the disc used a few months back and was glad to finally get a cleaned up, easier version to listen to. Its just one that I have been meaning to do. Overview - Considered by many to be the watershed release "Rip" was the bands second full length album. It would reach #1 on the charts and remain on the charts for close to 2 years. Four tracks would be released as singles from the record. This album would catapult the band into international superstars with the help of MTV and wildly exotic videos. 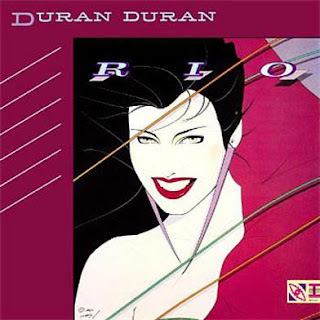 FDF Comments (aka the songs) - Opening with the keyboard laden title track "Rio" to this day will flash the images of the exotic local of the video. It has a sound very identified with the 80's for better or worse. Keyboards are an important part of the band and the guitars, although up in the mix often seem a little out of place. John Taylor has a strong bass line, something I had never really noticed before, but he is working hard on this track. With the popularity of the song, its amazing to realize it was the fourth and final single off the album. Fuzz guitars and a slapping bass bring up "My Own Way". The song as very catchy chorus and the electric drums (new for the time) are pushed up in the mix giving the track a techno dance feel. The chorus repeats what feels like 10 times in the song though. On a album with so many "singles/hits" "Lonely in Your Nightmare" is a welcome change to what you usually get with Duran Duran. The guitar and bass are the showcases instruments on the track. The guitars chime over the top as the bass line swoops under the verse. The keyboard and drums appear, only lightly, at the chorus. "Hungry Like the Wolf" follows. Is there really much I need to say about this track? Probably one of, if not the most recognized Duran Duran song for the video alone. The track reeks of 80s' pop sensibilities. There is not a lot of light I can shed on this track. "Hold back the Rain" is a track that deals with bassist John Taylor's emerging drug problem. Considering the heavy intention of the song its a catchy up tempo affair. The electric drums get a work out and the bass and keyboards fill vital roles in the track. "New Religion" has more guitar work at the outset than any other track on the record. For the first minute there is a solid work out of the guitar and bass with the drums holding it down. Keyboards only fade up as the verse progresses. "Last Chance on the Stairway" has another strong bass line under the keyboards. LeBon has, if nothing else, a consistent vocal delivery on this and all tracks. The verses have a quicker tempo and the song seems to flow along nicely. "Save a Prayer" opens (and closes) with a haunting keyboard line. The track is a dark and melodic track that many a high schooler at the time probably slow danced to. The album closes with "The Chauffeur". Another track with keyboards slowly bringing things up and the track will be mostly void of anything but keyboards/piano for the first few verses, but will remain as such for the entire track. Sort of an odd track to end the album with, but its not a "bad" song either. Where are they now? Duran Duran are still active today. There has been a few departures, and reunions, but Duran Duran as a band has continued to release new music. In 1985 John and Andy formed "Powerstation" with Robert Palmer and Tony Thompson. About the same time LeBon and Rhodes formed "Arcadia". At Live Aid in 1985 the band would perform for the last time as the "five" for close to 20 years. Roger Taylor would "retire" from exhaustion and Andy would keep busy elsewhere. The band would "reform" with all original members in 2000. Andy would leave again in 2006. FDF Personal Comments (aka the Live experience) - I have never seen any version of Duran Duran live. Tracks taken from "Rio" which you can buy here. Key Players - Brian "Head" Welch - Guitars, David Silveria- Drums, James "Munky" Shaffer - Guitars, Reginald "Fieldy" Arvizu - bass, Jonathan Davis - vocals,bagpipes. What caused me to blow off the dust? - I try never to listen to the same things over and over. For some reason this band is a band that I have followed for a long time. Although their music might not be ground breaking sometimes it just "does the trick". I just decided to go against the grain here, where I usually pick a lesser known release by the band, but this one I reached out for. Overview - The Bakersfield California based band released this, their third album in 1998. The production on the record far exceeded the prior two releases and the album would go on to sell over 9 million copies worldwide. 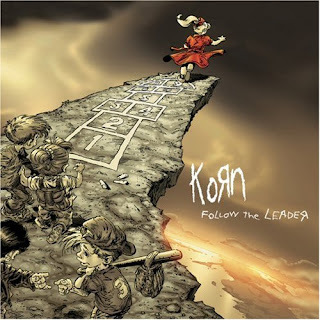 The album would reach #1 on the charts and continue to push "Nu Metal" to the rock radio forefront for a few years. "Reclaim My Place" before we get a yelp from Davis and then we are off once more. Guitars swirl, bass punches and the drums whack out the 4/4 time. The same boy the band was rumored to tribute at the start of the album (the silent tracks) had "Justin" named for him. This song has a very angry feel at the outset. The tracks sort of seem to follow the same formula in that they ease up during the verses but the chorus' hit down hard, real hard. Swelling up slow with a watery sounding bass is "Seed". We get a few of the sustained single guitar notes as well as the drums work up. When I spun this track again I recalled this being one of my favorites. Seed refers to a child. The chorus has a line that I really like "Every time I look at my son I see something I can not be..beautiful and carefree". "Cameltosis" is the third track on the disc to have a guest vocalist. Tre Hardson of the pharcyde offers his vocal delivery over a funk bass line. The album closes with a 15+ minute track/segment that begins with "My Gift To you". Davis plays the bagpipes on the intro to this track There is then a 2 minute gap of silence before an odd cover of "Earache My Eye" is done. The track originally done by Cheech and Chong (Up in Smoke) actually has Cheech Marin on the vocals as well. Where are they now? - The band is still active today. They continue to write, record and perform live. The band had done MTV Unplugged and has two "best of collections (one is due soon)". The band hopes to record and release a new album in 2008. David Silveria took a hiatus from the band in 2007. In late 2004 Brian Welch informed the band he had chosen the Lord Jesus Christ as his savior and would no longer pursue a role in Korn. He has openly spoken about his conversion (initially seen as a hoax) and is rumored to be working on a solo record. FDF Personal Comments (aka the Live experience) - I have only seen the band live one time and it was part of a Lollapaloosa set. The date was July 8, 1997 at the Tweeter Center in Mansfield Ma. The set was truncated for time, but live they brought it. FDF Overall Take - The band has sort of gone the way of the dinosaur. The tours are not as long, the albums don't sell as well and people just don't seem to care as much. For some reason, since this album I have bought every one within the week it comes out. I don't listen to them all that often but when I do part of me is glad I held on for this long.